If you want a portable, somewhat flexible and square-looking workstation with all the right bells and whistles and a fair amount of grunt, the HP Zbook x2 is a compelling choice. Boasting the formidable claim of being ‘HP’s most powerful detachable PC’, the HP Zbook x2 can be succinctly-summarized as a Surface on steroids. It’s a detachable PC that assumes you’re willing to make sacrifices on the inherent portability of a 2-in-1 form-factor in exchange for a level of performance that’s that much closer to the desktop experience. To some, this might come across as a tired, familiar and overly-presumptive tune. Fair enough, not everyone needs that level of performance and - accordingly - the HP Zbook x2 isn’t going to be for everyone. However, if you’re the kind of user for whom that assumption proves apt, then you’re probably going to be a fan of this one. 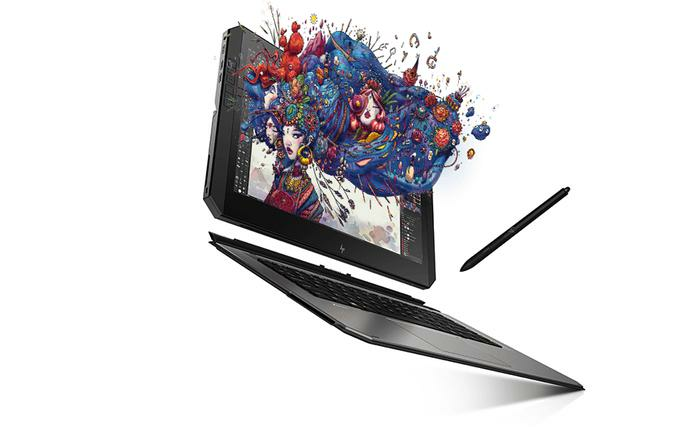 In terms of form-factor, the HP Zbook x2 draws from the 2-in-1 template in the broadest of strokes. That said, it doesn’t really try to shy away from padding things out with a little bit of bulk here and there. In terms of heft, it’s much more comparable to a gaming laptop than anything else in the current crop of convertible PCs out there. Still, despite the chunky bezels and blockish design, it does a reasonable job of looking stylish, courtesy of HP’s current design language. Unfortunately, the detachable keyboard that comes with the Zbook x2 isn’t nearly as robust on its own merits or by comparison. In terms of built quality and material design, it comes across as a very flimsy and tacked-on part of the package. This isn’t necessarily going to be a huge sticking point but when you consider the asking price, it’s a little irksome that it falls short of the mark here. Another shortcoming here is the dismal number of ports here. 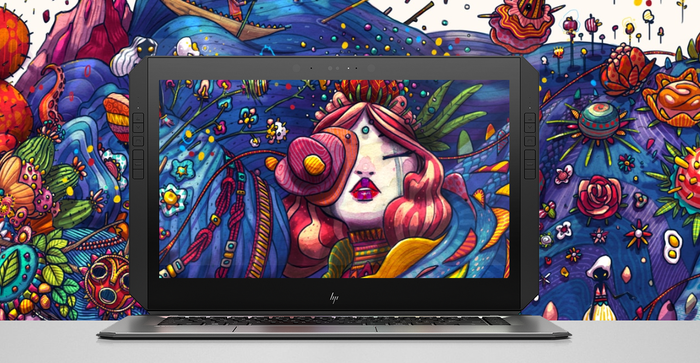 Yes, with USB Type-A, USB-Type-C, HDMI and Micro SD inputs in the mix - the HP ZBook x2 does cover all the major creative bases. However, the fact that it only features a single traditional USB port was a real limitation that I found myself running afoul time and time again during my experience with the device - despite being someone who uses a lot of USB-C hardware. Of course, the biggest thing that you’re getting here that you won’t find in Microsoft’s second-gen Surface Book (apart from the gorgeous 10-bit, 100% Adobe RGB, 4K multi-touch UHD display) is a battery-less Wacom EMR pen with 4096 levels of pressure sensitivity. We found this accessory reasonably responsive and accurate to use - but not necessarily all that more-so than we did with its ASUS, Dell and Acer-branded in equivalents. It’s a pro-level tool and pro-users will find the most use from it and even if it seems unlikely to replace their current kit, it does come across as a clear step above what Microsoft have on offer with their own Surface stylus. Regardless, it does seem a bit peculiar to imagine the hypothetical target user here: a professional graphic artist who is willing to spend this much on a powerhouse 2-in-1 like this but doesn’t already own a drawing or pen tablet with more robust featureset or specs than the built-in solution here. There’s a convenience to having to carry one product instead of two - but convenience only goes so far. Of course, the biggest and most natural competition facing the Zbook x2 is Microsoft’s own revamped Surface Book. Running the former through our usual suite of benchmarks, we found the ZBook x2 cleanly outranked slimmer, more mobility-centric fare like the Acer Spin 5 and the ASUS Zenbook Flip S but fell short of the Surface Book 2’s mighty Compute score. Given the Zbook X2’s claim to be ‘HP’s most powerful detachable PC’, we also threw into the gaming arena to see how it fared. To be clear, this is obviously not the intended use-case for the product - it’s designed to be a high-end workstation not a gaming rig. However, given the way that Microsoft use gaming performance to emphasize what you’re getting out of the Surface Book, it only makes sense to see how the X2 fares when run through the same gauntlet. As it turns out, the ZBook doesn’t fare quite as well here. Even if modern AAA games like Middle-Earth: Shadow of War ran at a perfectly playable framerate on low-to-medium settings, the ZBook x2 lagged behind the Surface when it came to graphics focused benchmarks. With the Surface Book 2, Microsoft tout a hefty 17 hours of battery life on the new Surface Book. Even though it is pretty firmly-pitched as an alternative to that product, HP aren’t nearly so bold on this front. According to them, a full charge will net you about ten hours of solid use. When subjected to the Battery Eater testing tool, the HP Zbook X2 took 2 hours and 25 minutes to dissipate its entire charge. This test is designed to burn the battery down as fast as possible and show off the minimum amount of battery life you can expect. 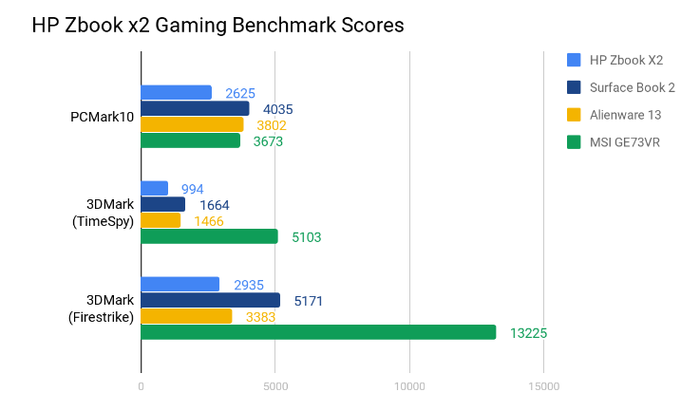 Since everyone’s ordinary usage patterns - and the impact that those patterns will have on your battery life - are going to naturally vary, this is generally a good way to gauge how the battery on one gaming notebook compares to another. 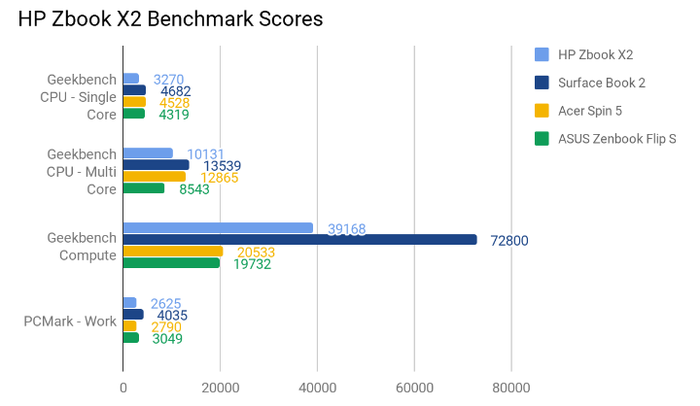 In context, the Zbook X2 fared surprisingly well and in-fact better than many other performance-heavy portable PCs out there. However, the usage we got here was well behind that which we got from its Surface competitor. The specs and performance afforded to it leave the HP Zbook x2 a more than worthy alternative to the second-gen Surface Book, doubly so if your intended use necessitates the bundled-in pen stylus and high-fidelity display. However, if you’re not the kind of pro-user capable of extracting the value from those features, there are probably other portable workstations out there that offer up both a better form form-factor and greater bang-for-your-buck overall. Still, if you want a portable, somewhat flexible and square-looking workstation with all the right bells and whistles and a fair amount of grunt, this is an entirely valid choice. It’s an option with enough compromises that it won’t suit everyone - but it is an option nevertheless. Again, not everyone needs a portable PC with quite this much everything but, if you are the kind of person this is for, you'll probably be right at home.